LEXINGTON, Ky. – The No. 24 Kentucky Wildcats opened Southeastern Conference play with a sweep, earning a 3-0 (25-15, 25-22, 25-18) victory over the South Carolina Gamecocks in the Carolina Volleyball Center. The Wildcats were clicking on all cylinders on the way to the sweep of the Gamecocks. On offense, the team registered 47 kills on a scorching .311 hitting. On defense, UK had 8.5 blocks while holding South Carolina to a .098 hitting percentage. With the victory, the Wildcats move to 8-5 on the season, with a 1-0 record in SEC play. South Carolina moves to 7-7 and now sits at 0-1 in the conference. The Cats head to Gainesville next, where they face No. 5 Florida in a top-25 showdown on Sunday, Sept. 27, at 1:30 p.m. The matchup is set to air on the SEC Network, with Tiffany Greene and Missy Whittemoore on the call. It seemed as if the Wildcats would lead from start to finish, when the Gamecocks looked to rally in the third set. After leading throughout the first two sets, UK and South Carolina tied 11 times with four lead changes early in the third set. Following a 12-12 tie, Kentucky rattled off its biggest run of the night, 10-1, to take a 22-13 lead before sealing the match, 25-18. Sophomore outside hitter Darian Mack paved the way for the offense, recording a match-high 16 kills on 35 swings while adding five digs and a block. Junior outside Anni Thomasson had eight kills and 10 digs on the evening. With the 10 digs, Thomasson has 643 career digs, moving her to fifth all-time in the 25-point rally scoring era. Sophomore middle blocker Emily Franklin and freshman right side Brooke Morgan each had seven kills and two blocks in the match, while sophomore middle Kaz Brown registered six kills and six blocks during the evening. Senior setter Morgan Bergren guided the offense with 34 assists, adding two kills, three blocks, three digs and a service ace. On the defensive end, sophomore libero Ashley Dusek logged a team-high 14 digs. She also had two assists and a kill on the evening. Freshman defensive specialist McKenzie Watson added seven digs and had an assist in the outing. Sophomore Harper Hempel and freshman Olivia Dailey both saw action in the match as well. It felt as if it was all Kentucky in the first set, as Kentucky opened the match on an 8-4 scoring spurt fueled by kills from Franklin, Thomasson and Mack. South Carolina pulled within two points, 12-10, before Kentucky opened another run, this time taking 12 of the next 15 points. The Gamecocks would claim two more points before Kentucky claimed the first, 25-15. Mack tallied a set-high six kills, followed by Thomasson with four and Franklin with three. Thomasson also recorded five digs in the set, moving her ahead of Christine Hartmann for fifth place in career digs during the 25-point rally scoring era. The second set looked similar to the first, with the Wildcats jumping ahead early. Two kills from Thomasson and another from Bergren powered UK to a 7-2 lead. The two sides exchanged points until Kentucky held a 13-9 lead, before the Cats took five of the next six points for an 18-10 lead, forcing the Gamecocks to call time. The resilient South Carolina team tried to rally, forcing Kentucky to regroup with a timeout and pulling within two points, 20-18. A timely kill from Morgan gave the Wildcats a 22-19 lead and backed South Carolina into using its final timeout. The Wildcats forced an error to close out the stanza, 25-22. 643 – Thomasson now has 643 career digs, placing her fifth all-time during 25-point the rally-scoring era. .098 – The Kentucky offense had a stellar outing, holding the Gamecocks to .098 hitting in the outing. 16 – Mack paced the offense with a team-high 16 kills on the evening on 35 total attempts. 6 – Sophomore Kaz Brown tallied six kills and six blocks in the win over the Gamecocks. It marks her third straight game with at least six kills and six blocks. 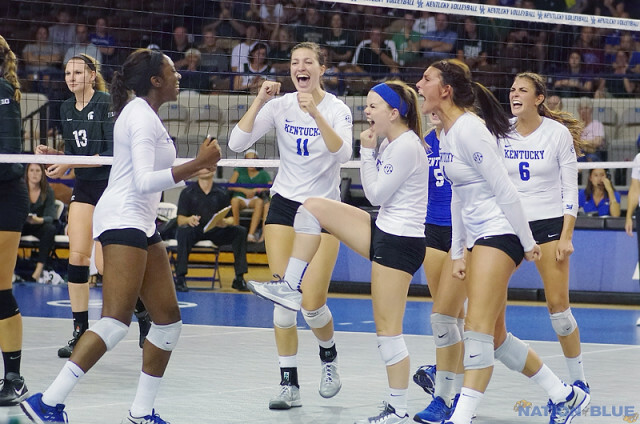 4 – The win over South Carolina marks Kentucky’s fourth sweep of the season, after topping IUPUI, Little Rock and Northern Illinois 3-0 as well.